Offering you a complete choice of products which include fully automatic paper cup making machine, paper cup making machine, semi automatic paper cup making machine and disposable paper cup making machine. 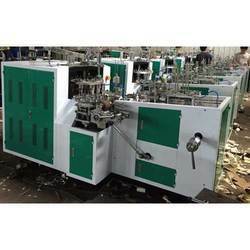 With an objective to fulfill the ever evolving demands of our clients, we are engaged in offering a wide assortment of Fully Automatic Paper Cup Making Machine. Being a leader in the industry, we are engaged in offering a qualitative range of Paper Cup Making Machine to our clients. Known for its noise-free operation and energy efficient design, the offered SemiAutomatic Paper Cup Making Machines are highly demanded in the market. 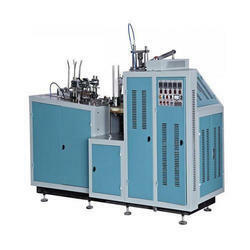 For the purpose of manufacturing best quality paper cups, the offered paper cup making machines are highly demanded in various industrial applications. These machines are rigorously checked on quality assurance parameters to ensure a defect free range. Single side PE coated paper is loaded to the printing press to reproduce the desired image on the paper. Printed PE Coated paper is then cut and punched in the die cutting machine according to the size requirements. Blanks after printing and die-cut are feed in pre-cut cup-fan-shape sheet PE-paper to the entrance of the paper cup machine. Stage 1: The paper cup blanks are then auto transferred to the cup-side sealing mold, in this stage the paper cup blanks are used in the side to form a cone shaped paper cup. Stage 2: In this stage bottom paper is fed at the bottom punching and turn table where bottom pieces are auto punched and cut in circular shape bottom from the rolling bottom real paper. Then the bottom is inserted and pushed into the paper cup cone. Stage 3: In this stage the paper cups with cone and bottoms are transferred to pre heating, per folding, heaters. Bottom Knurling: knurling the bottom to the cup-cone side where the bottom is firmly sealed to the cup by applying heat and pressure. Stage 4: Rim Curling: Curling the paper cups sharp edges is important. This is where the paper cup takes its final shape in the manufacturing process where the top edges and curled down by pushing the cup down with pressure – where the lip formation happens. Stage 5: The finished paper cups are finally discharge in the turn table and then transfer to the cup collection area. Paper Cups collected from the machine is then sent to packaging area for further packing process. 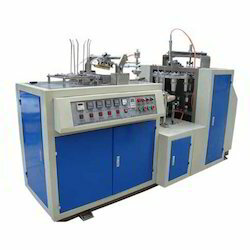 We offer high quality Disposable Paper Cup Making Machine to our valuable customers. 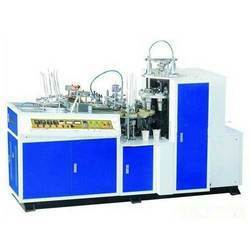 These machines are used in various industrial applications for the purpose of manufacturing best in class paper cups. Due to their user-friendly operations and longer functional life, these machines are highly demanded in the market. Looking for Paper Cup Machine ?